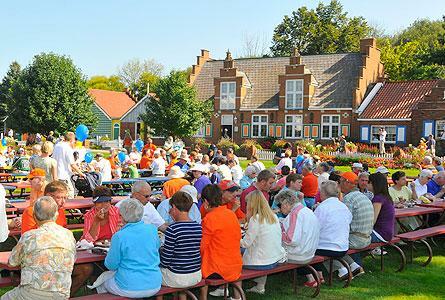 A picnic at Windmill Island Gardens and home Hope College football and women’s soccer games will be among the features of the 48th annual Community Day on Saturday, Sept. 14. The picnic will run from 11 a.m. to 1 p.m. Tickets include the picnic, admission to Windmill Island Gardens from 9:30 a.m. to 5 p.m. that day, and the football and women’s soccer games. The picnic will consist of bratwurst, hamburger, sliced turkey breast, vegetarian croissants, salads, chips, cookies, beverages and other picnic fare. The picnic will also feature door prizes and live music provided throughout by the Holland American Legion Band. Highlights at Windmill Island Gardens include several acres of gardens, dikes and canals; the Posthouse museum and shops; and, for children, the antique carousel and new playground. The historic DeZwaan windmill will be unavailable due to ongoing repairs. Pregame festivities for the football game will begin at 1 p.m., and will include a dedication ceremony at 1:15 p.m. naming the stadium in honor of Ray and Sue Smith. The college’s football game with Millikin University of Decatur, Ill., will begin at 1:30 p.m. The Zeeland High School marching band will perform during the pre-game and halftime. Hope women’s soccer will host Trine University at Van Andel Soccer Stadium beginning at 7 p.m. Completed in 1979 as Holland Municipal Stadium, the stadium is hosting Hope College football for a 35th season this fall. The college purchased the stadium from the City of Holland and extensively renovated it in 2012, and has renamed the facility for longtime former coach Ray Smith and his wife Sue. Ray Smith, who taught at Hope from 1970 until retiring in 2009, coached Hope football for a quarter of a century (1970-94). Tickets for Community Day cost $9 for regular admission and $4.50 for children age five to 11, with admission free for children under five. Tickets may be purchased in advance at the ticket office in the main lobby of the DeVos Fieldhouse or at the downtown ticket office in the Anderson-Werkman Financial Center, or ordered by calling (616) 395-7860. Both ticket offices are open weekdays from 10 a.m. to 5 p.m. and can be called at (616) 395-7890. Tickets will also be sold at the picnic site on the day of the event. Throughout the day during Community Day, the gallery of the De Pree Art Center will be featuring the exhibition “Art for Commerce,” featuring work by Charles S. Anderson and Laurie DeMartino in collaboration with French Paper Company. The exhibition is running Friday, Aug. 30, through Sunday, Oct. 6. The gallery is open Mondays through Fridays from 10 a.m. to 5 p.m., and Saturdays and Sundays from 1 p.m. to 5 p.m. Admission to the gallery is free. At 7 p.m. on Saturday, Sept. 14, the Hope theatre department will host the Milagro Theatre of Portland, Ore., in “Frida un retablo,” a bilingual production of a play by Dañel Malán based on the life of Frida Kahlo, the famous Mexican artist. The event, presented in conjunction with the 12th annual Tulipanes Latino Art and Film Festival, will take place in the main theatre of the DeWitt Center. Admission is free. The Anderson-Werkman Financial Center is located at 100 E. Eighth St., between College and Columbia avenues. The De Pree Art Center is located is located at 160 E. 12th St., facing Columbia Avenue. The DeWitt Center is located at 141 E. 12th St., facing Columbia Avenue at 12th Street. Ray and Sue Smith Stadium is located at 313 E. Fairbanks Ave., near 13th Street. Van Andel Soccer Stadium is located at 225 Fairbanks Ave., near 11th Street. Windmill Island Gardens are located at 1 Lincoln Ave., north of Seventh Street. Additional information about Community Day may be obtained by calling the college’s Office of Public and Community Relations at (616) 395-7860 or online at hope.edu. In the event of rain, the picnic will be moved to the dining room of Phelps Hall, located on the Hope campus at 154 E. 10th St., along Columbia Avenue. If the picnic is moved inside, announcements will be made online at hope.edu and on area radio stations. The Hope College men’s soccer team is a close second in the Michigan Intercollegiate Athletic Association (MIAA) Preseason Coaches Poll announced today.